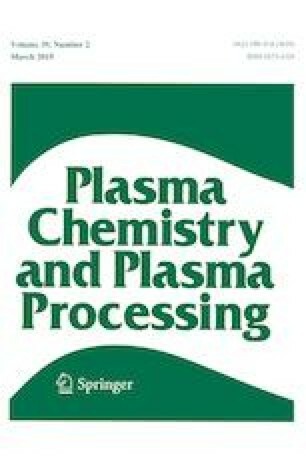 Strong Sensitized Ultraviolet Luminescence from He–C2F4–NO Flowing Plasma Afterglow: A Route to Short-Wavelength Gas-Flow Lasers? Unexpected strong ultraviolet emission has been observed from the merger of two low-pressure supersonic gas-flows previously leaving two radiofrequency (RF) discharges, one containing Ar, He, O2 and traces of NO, the other He and plasma-chemically produced C2F4. Analysis of the spectral emission data over a range of 190 to 710 nm shows that the main energy carriers in this radiofrequency powered flowing discharge afterglow are He, C2F4 (or CF2) and NO. Plasma-chemical excitation and energy transfer amongst the main energy carriers result in a spectrum dominated by a vibronic structure, covering the spectral range from 190 to 300 nm, which is assigned to the spontaneous emission from excited nitric oxide. The strongest line located at 236.2 nm is due to the NO(A2Σ+, 0–1) transition. The distance between the point of observation and the nearest RF discharge together with the residence time of gases in this region excludes any direct excitation of NO by the RF discharge itself. The observed phenomenon has potential as a plasma-chemical gas-flow laser emitting at a fundamental frequency in the mid-ultraviolet spectral region. The research reported in this publication was supported by funding from Czech Science Foundation under the Project GAP102/12/0723 and Czech Ministry of Education, Youth and Sports under the Project LTT17015. We thank our former co-worker Miroslav Čenský for his initial help with preparation of spectral measurements.